The threat of total abandonment of NAFTA took on a second front today as Canada’s biggest private-sector union said NAFTA should be scrapped if Mexico cannot agree to better labor standards. Please consider Sharp Differences Over Labor Surface at NAFTA Talks in Mexico. Tensions over sharp differences in pay between Mexican workers and their Canadian and U.S. counterparts surfaced on Sunday as negotiators discussed labor market rules in talks to overhaul the North American Free Trade Agreement. Canada’s biggest private-sector union said NAFTA should be scrapped if Mexico cannot agree to better labor standards, clashing with Mexican business leaders who argued that workers rights were a matter for each country to resolve internally. 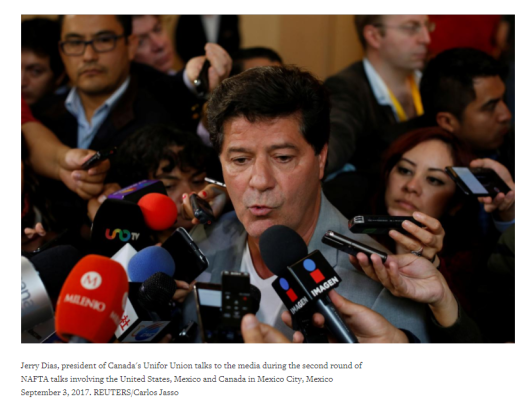 Labor union leaders in the two wealthier nations say laxer labor standards and lower pay in Mexico have swelled corporate profits at the expense of Canadian and U.S. workers, making resolution of the issue a major battleground of the NAFTA talks. “If labor standards aren’t a part of a trade deal, then there shouldn’t be a trade deal,” Dias told reporters in Mexico City on the sidelines of a second round of negotiations to update the 1994 trade agreement among the three countries. Bosco de la Vega, head of Mexican farm lobby, the National Agricultural Council, said more trade, not intervention in labor markets, was the best way for the region to grow economically. “Mexico can’t interfere in the labor market issue in the United States and Canada. We ask the same: that they don’t interfere in these matters,” he told reporters at the talks.